Another great edition of Sounds of the Bazaar – brought to you in conjunction with online-Educa Berlin. First up is my introduction to the show, where I tell you about the fabulous up coming Bazaar conference. This is followed by Graham Attwell’s periodic rant. This months rant is about the tyranny of assessment and I look at alternatives based on Assessment for learning as opposed to the assessment of learning. If you enjoy this and would like to hear more you can watch my video on E-learning 2.0 and Quality. Our interview is with Jay Cross who talks about informal learning. Jay’s web site describes him as a “champion of informal learning, web 2.0, and systems thinking. He puts breakthrough business results ahead of business as usual. His calling is to change the world by helping people improve their performance on the job and satisfaction in life.” In the interview he talks about what he means by informal learning, the difference between training and learning, what organisations can do to promote informal learning and how education systems might change in the future. Ulf Daniel Ehlers tells us about his idea for Science without Borders. Ulf is an Assistant Professor of Business Information Systems, at the University of Duisberg-Essen in Germany. He is Coordinator of the European Foundation for Quality in e-Learning and coordinator of the European Quality Observatory. the more you know, and share it, the more these issues repeat along time… and the more you can reach new people to learn more and more. Claire Belisle talks about her research on information and digital media. Claire Bélisle est ingénieure de recherche CNRS en sciences humaines et sociales. Elle a un doctorat en psychologie cognitive, et un diplôme en formation en ligne. Ces centres d’intérêt en recherche sont la navigation et les méta-compétences des formateurs, enseignants et chercheurs dans l’intégration des technologies de l’information et de la communication en éducation et en recherche. Elle pilote actuellement des travaux sur le livre électronique et sur les corpus numériques, en se focalisant sur la navigation dans les hypermédias, le travail collaboratif et la lecture numérique. But don’t worry if your French isn’t too good – the interview is in English! Finally I talk us out of this issue. Phew – that is a lot. I know the full edition is long. But the music is just brilliant. As ever many thanks to Dirk Stieglitz who produced this issue. Some people seem best with text, some with diagrammes. Me, I am a text person. I find it hard to understand the graphic representations. 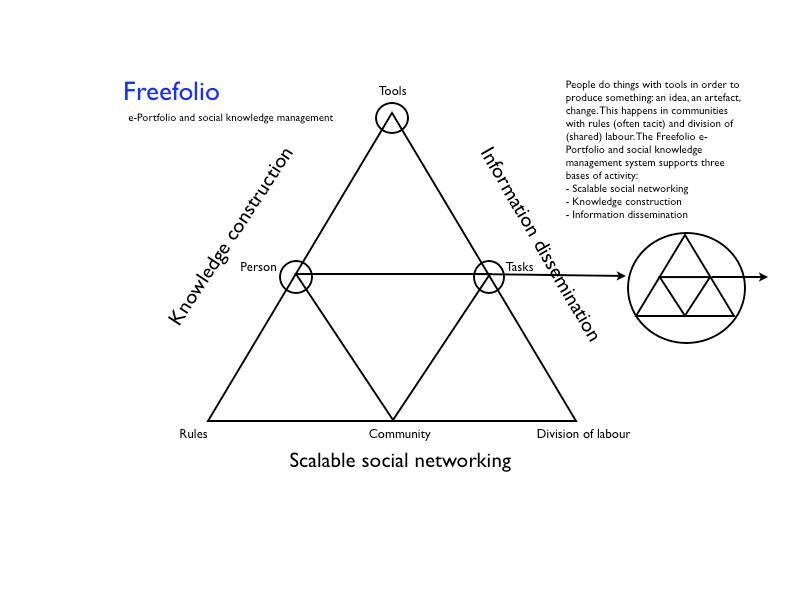 But, when I was working on a progress report on the development of Freefolio, I did adapt (or repurpose) an activity diagramme (originally produced by George Roberts for the Emerge project) to show the ideas behind Freefolio. If you are a visual kind of person, this may make sense to you. As regular readers of this blog will know, I have spent a lot of time over the last year working on e-Portfolios and Personal Learning Environments. And I get bored just talking about things, I like to do them. So I jumped at the chance to develop and test an e-Portfolio system. This is the result – Freefolio. The development work has been undertaken by my friend Ray Elferink from Raycom in partnership with Pontydysgu. Why didn’t we work with an existing system? We thought very hard about it. It seemed that many of the dedicated e-Portfolio systems were too restrictive. They started from an institutional definitions of what learning would be represents through the e-Portfolio. Others – like Mahara – seemed geared towards particular sectors in education. On the other hand many people were using blogging and social networking systems for e-Portfolio development. that was nearer my idea. However, we were concerned that the basic structure of a blog entry did not provide another support for reflecting on learning. And so we came up with Freefolio. Freefolio is based on WordPress. Within this we have implemented structured blogging, allowing XML templates to be added to the dashboard for particular kinds of post. There is more work to do – isn’t there always – and we know this version may not support everything you want of an e-Portfolio. But it is Open Source and easily extendable. Want to have a look? Go to http://demo.freefolio.net and set yourself up with an account (don’t worry if you get a rather strange name on the from field on the confirmation email – we will sort that as soon as Ray gets access to the server). I have tried to populate the site with a little content. Please add some of your own. And tell us what you think. We are planning to host Freefolio installations in the future for organisations who want this. And of course, we can build new features and customised versions. But, if you want to install Freefolio yourself, we will be releasing the code in the very near future. And we will be developing a web site around the demo install. I will write more about Freefolio over the coming days. But now is the time to put it out, I think. Release often, they say. I like learning. I am in favour of learning. I am in favour of young people getting the best possible qualifications and opportunities. But the latest UK government moves to raise the school leaving age to 18 is not helpful. Once more they have confused institutional attendance with learning. Just because a young person is signed up for a regular course does not mean they will learn. And if they are not attending school or college it does not mean they are not learning. One of the stated concerns of the government is that the number of jobs for unskilled (their word for not possessing a formal qualification) will fall dramatically in coming years. I am not sure this is right. It is based on the rhetoric of the information society. Is there real evidence this is likely to happen? But the worst proposal, announced in todays Queen’s speech is the proposal to criminalise those who do not participate. Those who do not stay on in school or work-related training, reports the Guardian, will be served with an “attendance order”, which has been dubbed “the education Asbo”. If they breach this order and refuse to study for a recognised qualification, 16- and 17-year-olds will be guilty of a criminal offence. They will then face a £50 spot fine or a £200 fine in court. But they will not be sent to prison. So learning or education is something we force people to do at the risk of a large fine (with presumably more sanctions for those unwilling or unable to pay). This provides all the wrong messages. Instead of forcing young people into a system which is failing so many of them, why not turn the focus on learning opportunities. Instead of a Qualifications Framework why not a Learning Framework. Why not ensure every job, skilled or otherwise, offers rich learning opportunities to everyone and with a choice of learning modes. This would entail a new view of learning – as learning inherent in human activity – rather than being segregated as something which takes place in institutions. And it would entail a new role for work – seeing learning as something as natural to the workplace as working. Ah well – dream on. This is a pretty remarkable story and shows the potential of Multi User virtual Environments for doing some good! I was there! Sadly I can’t find the snapshots. But here is a (rather small) picture of my avatar, Graham Lightfoot, proudly wearing the trade union t-shirt. From a press release from the IBM Italy trade untion: “One month after a virtual protest staged in Second Life with almost 2’000 avatars demonstrating on IBM islands, a new contract with IBM Italy has been signed. The new agreement, which still needs to be approved by the IBM Italy workforce, reinstates the performance bonus that was cut unilaterally by IBM Italy management. The agreement signed by IBM Italy and the trade union Rappresentanze Sindacali Unitarie (R.S.U.) not only includes the performance bonuses from 2007 up until 2010 but also payments by IBM into a national health insurance fund and also states that negotiations will continue with respect to IBM industrial and business strategies in Italy and the improvement of internal communication policies. The situation abruptly improved and negotiation resumed after the former country manager left IBM in the mid of October, who had signed responsible for the pay cuts in the first place. His departure cleared the air and facilitated constructive negotiations between social partners as this could be expected from a professional management of a high-tech company. With all the work of developing the Pontydysgu web site and moving my blog, I have slipped behind with the content. ‘Grab the future with your e-Portfolio‘ (PDF download) is a study I have co-authored for the EU funded Mosep project. The foreword explains the background to the study. “The willingness to put one’s self esteem on the line may be one of the key factors for self determined learning. Once adolescents are comfortable with determining their own destiny with respect to learning they will become open-minded to new ways of organising their learning. This appears to be a prerequisite for the kind of life-long learning which should become the foundation of the knowledge based society. And the need for change applies to teachers as well: they too, will need new skills and competencies in order to be suitable companions for the self-determined young learners they will be faced with. The MOSEP project – more self-esteem with my e-portfolio – aimed at providing a study, course materials and on-line information to acquire these competencies. The study you are reading provides some of the theoretical background and practical guidelines for teachers and vocational counsellors in order to equip them for the challenges that they will face as roles change from “teacher” to “learning companion”. Chapter two describes the theoretical background for supporting adolescent learners. It then describes the novel concept of e-portfolio and demonstrates its uses in life-long learning for this particular group. Chapter three looks at e-portfolio from an institutional and organisational perspective and points at some of the critical success factors in implementing the methods and tools in a formal educational context. Chapter four specifies new competencies and skills for teachers when their role changes towards supporting the learners in an e-portfolio environment. Chapter five gives a survey of current software tools for e-portfolio work with special emphasis on the functionality expected from such tools. 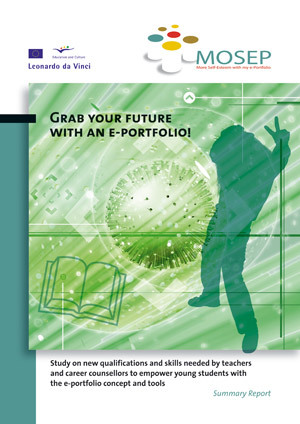 The study also looks at the suitability of these solutions for e-portfolio beginners. Networks, Communities & Learning: Show that you Share! Pontydydysu is a partner in the European funded Bazaar project and I will be speaking at the project conference in Utrecht in December. This looks like a great event. I am really happy that people are getting more imaginative in how they organise these type of events. The conference is free. Please do try and come along. The conference flyer is attached with this post. The major aim of the conference is to promote dialogue and exchange between ‘experts’,researchers, developers, practitioners and learners. We are particularly keen that learners and junior researchers are given an opportunity to discuss and exchange their ideas. We aim that the content of the sessions is driven and created by the participants rather than the traditional ‘presentation and five minutes questions’ format with content determined in advance by a single organiser, or a small group of organisers. The Conference is free but we would ask you to inform Raymond Elferink if you intend coming (not least of all because we are providing a free lunch). Details of accommodation in Utrecht etc will be posted on the Bazaar Web site. There is nothing surprising in the report in the Guardian on a study by Cambridge University on standards in primary school. Perhaps most shocking is that it has taken so long fro someone to say this. And that in the face of all the evidence the UK government still refuses to acknowledge that the test and target regime introduced in English schools is a failure: a failure in raising standards, a failure in imposing unreasonable stress on students, a failure in terms of constraining pedagogic approaches and a failure to trust in imagination and learning. “As many as one in three primary school children is given the wrong marks in national tests, according to a report on standards in primary schools. Sats for seven- and 11-year-olds, which are used to assess their progress and feed into national school league tables, are unreliable, put pupils under psychological pressure and have had little impact, the report says. The researchers accuse the government of ignoring academic evidence, backed by the then Statistics Commission, that the dramatic rises in results in the run-up to 2000 were “exaggerated”. The report commissioned for Cambridge University’s review of primary education comes after the prime minister pledged to put testing at the heart of the next phase of the government’s plan to eradicate failure. Ministers believe that without nationally comparable tests teachers are not able to target pupils who are falling behind.